Wash the persimmons thoroughly. Remove the green cap from the top. Take a tsp and scrape the gooey inside of the persimmon into a bowl through the hole that was created from removing the cap. Then place the skin with remaining persimmon into a shallow plate and scrape it completely off using two spoons. Place the scraped off content in the bowl. You’ll know you are done scraping when only skins remain in the shallow plate. Garnish the persimmon with some chopped walnuts. Enjoy! I’m back 🙂 Sorry for not being able to post this ‘recipe’ yesterday but we had a really nice time on our trip and we stayed longer than we’d planned. When I came back home I was only able to take a shower and fall asleep. However, I managed to take a photo of this lovely energetic day-starter that I prepared right before we left. I am not a professional photographer, so please forgive me for the not-so-good photos. Once I get into routine with this blog I think I will manage to produce photos that will do justice to the taste level of these marvelous vegan recipes. It’s winter here in Macedonia, it’s really cold and there is snow from time to time. Our doctors like to call it ‘the flu season’ and I like to call it ‘the fat season’. The holiday season is always related to plenty of prescription drugs and the inevitable abundance of food. And what better way to stay fit and healthy, and at the same time eat with no restraints, than to go vegan for the holidays (and continue being vegan afterwards)? I will have tons of tasty desserts for you in my following posts, but desserts like these really make my day (from time to time). I am a gal that likes her change, so I can’t constantly eat the same things over and over again. Of course I have my favorite dishes and of course there are periods when pasta and polenta is all I eat, but once that streak is over I like my versatility. I am known for never saying no to new dishes and fresh types of food, so I never refuse a restaurant invite where I always try to have some new interesting meals and then share the recipes with friends because in Macedonia there are no strictly vegan restaurants, nor that many vegetarian for that matter. They just opened two vegetarian restaurants this year and both of them are take-out-only. There is also one macrobiotic restaurant (take-out-only too) where 90% of the food is vegan, but then again, they also have egg-fried dishes and some fish on their menu. With its 14% RDA of dietary fiber per 100 g it greatly eases the functioning of the digestive system, offering relief from diarrhea and alleviating similar bowel-movement related issues. Even though it’s fairly sweet it’s convenient for diabetics because it’s known for its sugar-regulating abilities. Persimmon is good for those who suffer from hypertension due to its low levels of sodium. Being a rich source of phytochemicals as well as containing important anti-tumor compound betulinic acid, persimmon aids in warding off unwanted inflammatory reactions and infections and helps fight cancer. It’s a natural anti-haemorrhoid and even though it can help you satisfy those hunger cravings, at the same time it can be a life-saver while shedding those extra pounds. 12% RDA of vitamin C per 100 g makes it a perfect little warrior that boosts your immune system and keeps those nasty prescription drugs (i.e. chemicals) at bay. Besides being rich in vitamin C it also contains vitamin B and significant amounts of vitamin A, and it is an established fact that vitamin A has the potential to improve vision. 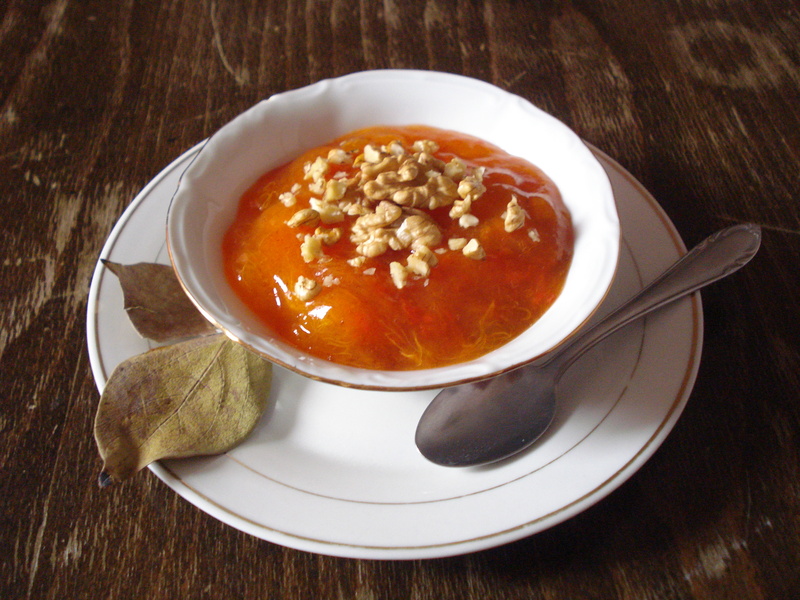 The copper in the persimmon helps the proper absorption of iron, which in turn helps the production of red blood cells. All Orthodox Christians celebrate Christmas Eve tonight (6th of January) according to the Gregorian Calendar. It’s a day when families gather and eat vegan dinners – it’s a tradition. The majority of Macedonian citizens are Orthodox Christians. So I will not be posting another recipe today because I’m about to go to my parents’ and prepare many wonderful dishes for tonight. I’ll try to take separate photos of every dish and then post each recipe here. I will also try to take a photo of the whole table with all the dishes on it. In my post from tomorrow I will tell you a little bit more about this Orthodox holiday. Until then, don’t forget to buy persimmons and have a lovely and healthy snack. Yum! I love persimmon and this looks yummy and healthy!